By Dr. James Schaller, M.D. During the last twenty years, physicians and patients who were knowledgeable about Lyme increasingly realized that tick bites were "dirty" and carried a wide range of infections. Perhaps the most important of these co-infections is Babesiosis. This is an infection of red blood cells loosely related to malaria. 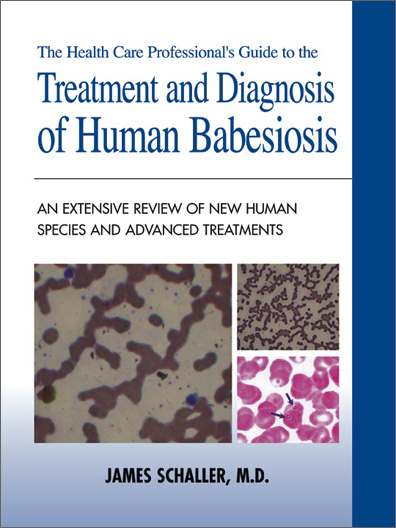 In 2006, I realized there was no up-to-date book addressing cutting-edge Babesiosis diagnosis and treatment, so I wrote a textbook on this critical infection, intended for doctors and patients alike. The article below offers some important key elements from this past year of research. First and foremost, the notion that Babesia is rare is false. In one study which took place just over the United States border, 36% of Mexican citizens tested were infected with the strain Babesia canis. This infection is not supposed to be common in humans, but is sometimes found in dogs. In another study, 3-8% of blood donors in the United States had Babesia microti. Second, one study found that Babesia as a co-infection is common and present in 66% of patients with Lyme. This co-infection makes the patient commonly suffer from nearly fifty different symptoms which include fever, waves of warmth, sweats, chills and fatigue. Babesia can also cause red blood cells to become be deformed and stick in tiny organ capillaries and cause dozens of debilitating symptoms. The current state of diagnosis is unfortunately very poor. Typically, patients with known Babesia infection have lab tests which return negative on both PCR's (DNA) and antibody tests. These results occur despite the routine use of large, respected national labs. Further, the blood stains used are a fraction of those infecting humans and can require hours of manual searching with 1000x power with oil. This tedious searching is rarely performed. To understand the magnitude of the blindness in blood smear testing, we need only to look at a similar illness, the process of malaria testing. 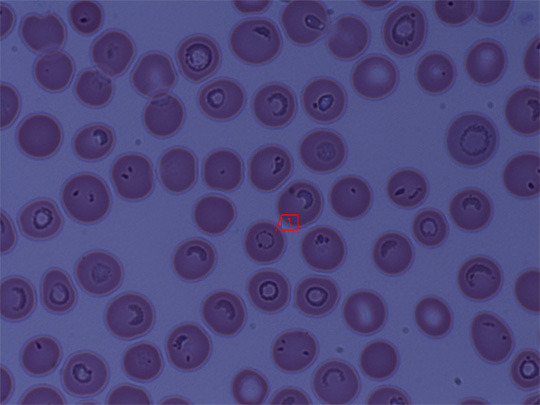 Under the microscope, Malaria appears very similar to Babesia when present within the red blood cell. In one Baylor Texas Medical center study of 59 patients with clear malaria, 80% were given the wrong initial diagnosis, and some patients died. Further, I have repeatedly heard that Babesia always causes anemia—which is untrue. One Babesia form initially located on the West Coast is now found all over the US. That form is Babesia duncani (WA1-3 and CA5, 6). WA and CA stand for Washington and California, and patient numbers. Interestingly, this duncani form presents without anemia and other Babesia species also have patients presenting without anemia—especially if the quantity of Babesial infection in an individual is low. WA1-3: Three patients with this unique Washington state (WA) form. CA1-4: Four patients with unique California (CA) form. CA5, 6: Two more California patients with a unique Babesia. B. duncani: A new species that includes both WA1-3, and CA5, 6 and can be either mild or aggressive. This is a very serious discovery because this form does not appear to be rare. For example, one of the first patients found with this species of Babesia (WA1), had neighbors with high antibodies showing they were also infected with WA1. How rare could this be if four folks on the same street are positive? Further, WA-1 has increasingly been found in the western states, including California, the most populated state in the US. The symptoms of these patients range from no signs of illness, to a mild infection or "flu," to severe illness. MO1: Discovered in a Missouri patient, so it is identified as MO. B. odocoilei: A type of Babesia found in select deer but which can also infect humans. EU1: A form discovered in Europe and abbreviated EU. However, over time, Babesia forms which are supposed to be limited to the US or Europe are found on other continents, e.g., microti and divergens. EU? : A curious Babesia type related to B. odocoilei, a parasite of white-tailed deer, but unrelated to European B. divergens. This human-infecting Babesia has new unreported molecular characteristics. B. canis: A form of red cell parasite found in dogs which also infects humans. B. bovis: Another form of Babesia that can infect humans. B. microti: The most common form in the United States, which is often carried by mice. B. divergens: A form commonly thought of as cattle Babesia, but it also infects humans and is very aggressive. It is the most common Babesia in Europe. B. equi: A form common to horses but which can infect humans. B. "unidentified": Increasingly various forms of Babesia are described as "unidentified." This does raise a question about the clinical abilities of some pathologists and the education they are receiving about Babesia. It also raises the issue of how many forms of Babesia species are yet to be identified. Perhaps they are unidentified because they are unique new species. Since Babesia lives within red blood cells, it can cause slugging of the red blood cells and make them slightly deformed. Injury and death can result from slugging blood vessels, lungs and kidneys. Babesia, Bartonella, Lyme biotoxins, Mycoplasma and mold mycotoxin exposure should always be considered in patients who do not respond well to solid Lyme treatment and who seem to stretch on without improvement. The research is universally clear that Babesia with Lyme is much more disabling and the treatment requires more aggressive and diverse options. The reality when using top labs with improving lab tests is that almost all Lyme is "dirty." Almost all deer ticks pass on many infections and not just one. Just like humans, deer ticks have many things in their stomach. We have found the diagnostic abilities of well-known national laboratories to be extremely weak, only recognizing approximately 1 out of 25 Babesia positive patients. Currently, IGeneX offers a special FISH probe test that offers 100x better visibility for Babesia microti in a blood smear and offers a test for WA-1 or Babesia duncani which is believed by some to be limited to the Western coast, but which is actually now found all over the East coast. National Diagnostic Labs offers two Babesia PCR and antibody tests that are useful if repeated a number of times. 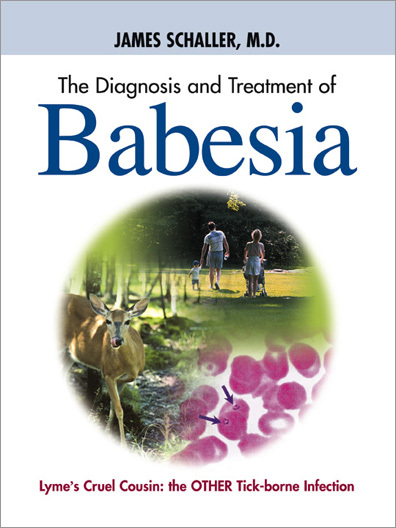 As of December 2006, one exciting new technology has proven extremely useful to our Babesia diagnostic practices. A new patent-pending blood stain is now in use that will very likely completely revolutionize Babesia diagnosis, because it shows all species of Babesia as highly visible infections. It does the same thing for the many strains of Bartonella. This new blood stain does not require new DNA or antibody technology and is being successfully used by only a few research oriented clinicians at present. Results are clear to anyone with 20/20 vision with a functional brain. No special training is required to see the infection present in the blood pictures provided to physicians and their patients. Below is a sample of Babesia inside red blood cells and some small dots outside the red blood cells presumed to be Bartonella bacteria. 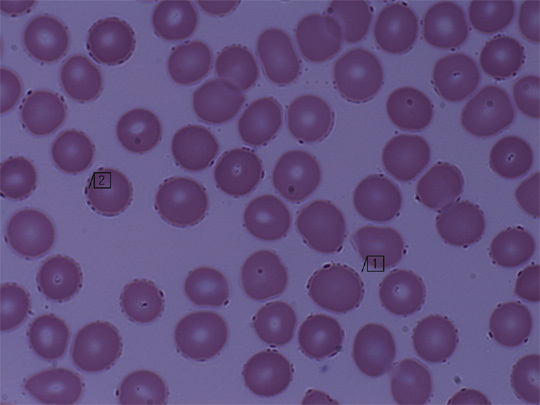 Here are some sample Babesia images. 19 yo patient with 2 years of fatigue, myalgia, arthralgia. Note adherent string of coccobaclii consistant wit descriptions of Bartonella in the literature. 1000x magnification with oil. A young boy with Asperger's Syndrome. Nearly every erythrocyte is infected with Babesia ring forms, crescents, or 'foamy' forms. 1000x magnification with oil/ This patient has longstanding rheumatoid arthritis and insulin dependant diabetes. The flag denotes the fine lacy ring shape. 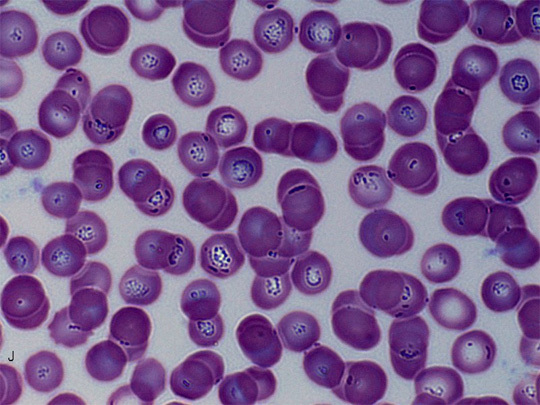 Note the wide varieties of Babesia forms in many other red blood cells. As you look at the red blood cells please note some seem to have a nucleus. But red blood cells do not need a nucleus to carry oxygen. They have no nucleus—that ring is a parasite. It is Babesia. Other cells have moon shaped crescent forms, two poles or a foamy looking center. Most Babesia research suggests the best treatment for adult patients is Mepron (atovaquone) 750 mg twice a day combined with Zithromax (azithromycin) 250 mg twice daily. The research on all treatments is very limited and each treatment usually only has one to nine studies, most of which are not performed at an advanced academic level. Much of the current research represents only small groups of patients or animals receiving clinical care utilizing various treatment options. Further, most of the treatments suggested are applications of malaria research since malaria has some similarities with Babesia. The other treatment options for Babesia include high dose Mepron, combinations of Malarone, Lariam, Bactrim DS, Flagyl, Macrolides (Zithromax, Biaxin and Ketek), Doxycycline, Plaquenil, Clindamycin, Quinine, Artemisinin and Artesunate. The latter two treatments are taken from Chinese medicine and are now recommended as leading treatments against malaria according to the World Health Organization (WHO) and the United Nations Children's Fund (UNICEF). 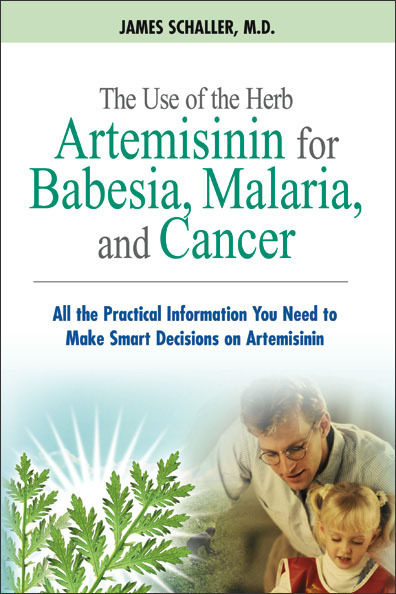 We have published the most up-to-date English language book on Artemisia, Artemisinin, and Artesunate because we were finding physicians and patients had no understanding of these products. For example, many drugs are derived from the Artemisia plant and some are potentially toxic to hearing and the brain, while others are well tolerated. Some Artemisinin advertisements call this herb "Wormwood", which is false since it is actually called "Sweet" or "Annual Wormwood," and does not have Wormwood's toxic chemicals. Significant ignorance exists as to the proper dosing for the treatment of Babesia and is still evolving. Many advertisements report 400 mg per day of Artemisinin is optimal, but this is based upon limited advanced science. The WHO suggests for malaria, a dose of 1200 mg on day one and 600 mg any additional days. Further, Artemisinin has a radical drop in blood level over five days, so that 500 mg is roughly equal to 100 mg after a week. I have yet to see this reported in herbal advertisements. However, the active metabolite dihydroartemisinin seems to remain steady in preliminary research. Claims of "cures" on artemisinin alone are possible, but should not be based simply on a feeling of improved health. We suggest including images which show that infected cells are now visualized as clean. 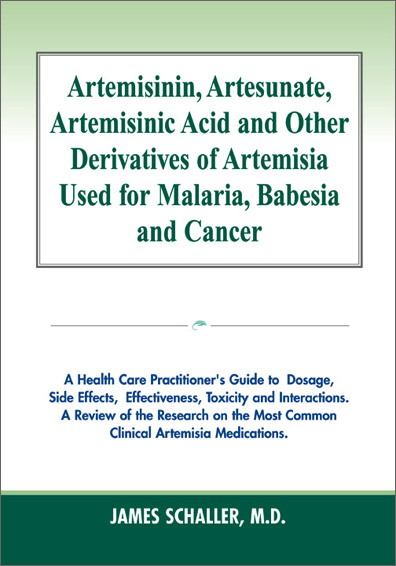 Artemisinin patients often eventually relapse, or Babesia residues are found in the blood so this is one reason why all Artemisia derivatives are paired with synthetic malaria drugs during malaria treatment. In general, Artesunate from Hepapro.com is felt to be a stronger form of Artemisia and is taken in three divided doses in adults. Since it kills by methods that include free radical formation, multiple anti-oxidants are recommended to help the red blood cells regain their smooth surface and to prevent Artesunate from causing free radical damage. We are researching the best dose of Artesunate because it is not as successful at killing Babesia as it is for malaria. In conclusion, we have discussed the rapid new emergence of many new Babesia stains, samples of the signs and symptoms of Babesiosis, the various options in diagnosis and some of the most common treatment options.